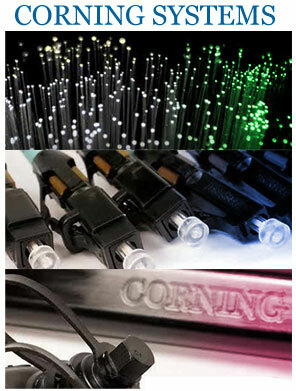 Corning Cable Systems is the leader in fiber optic cables. This corporation has released newly innovated designs for fiber optic cables, such as one brand that can bend beyond others without damage. Corning Cable Systems sells and manufactures components for the passive fiber transmission subsystem. The demand for optical fibers has grown exponentially since the 1970’s. Optical fibers have a wide variety of uses. The most common applications are medicine, military, telecommunications, automotive, and industrial. There are many applications for fiber optic cables and Corning fiber optic cables are among the best! Fiber optic cables are used to carry information from one place to another using light. The speed of light travels extremely fast, so most companies prefer to use fiber optic cables. Unlike copper, fiber optics are not electrical in nature. There are many benefits of using optical fiber systems rather than metallic-based communication systems. One advantage is the long distance signal transmission. Optical systems have low attenuation and better signal integrity, which allows longer intervals of signal transmission. Copper systems require in-line signal repeaters, while optical systems can go over 62 miles with no such processing. With new technologies taking place, greater distances will result in the future. Another advantage of fiber optic cables is that they save conduit space since they are small in diameter and light in weight. These cables have a large bandwidth while still having a small size. In the future, this growing technology will continue to evolve resulting in even greater distances.